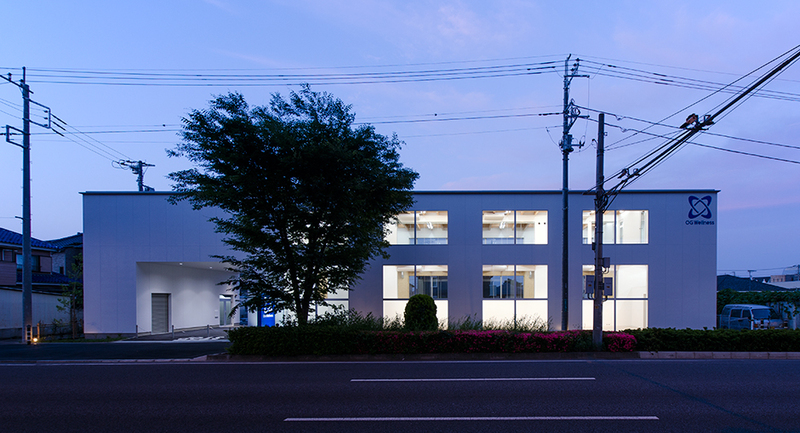 Office of Windows is an office building for a company that specializes in physical therapy and rehabilitation equipment. It is situated along National Road in the Greater Tokyo Area, Saitama, Japan. The client is a pioneer for specialty equipment who has recently shifted focus to brand awareness and industrial sales to better reach their customers. Due to the recent increase of competition in the rehabilitation industry, the company wants to build greater awareness for their products. To meet our clients interests, we designed an office where almost half of the building space has been allocated to customer sales and discussion spaces. Given the site conditions and neighbouring road, we thought it would be best to give the building an entire shopfront for its facade. A series of windows display the company's products one by one, like a sequence of picture frames. The shopfront is the heart to a company's products. The building is simply a backdrop to complement the products on display. Simple white walls with square windows line up along street, and each opening frames a window with a product on display. The framing effect makes each product stand out, creating a series of images for the viewer. One by one, the windows showcases its goods, ready to capture the eyes of each passerbyer the moment they come past. In this regard, we want people to be less conscious of the buildings actual presence and to be more conscious of the shopfront windows. We put specific thought into omitting commonly accepted details from the facade, reducing detailed parts to a bare minimum. The wall thickness itself is minimized and was designed with the smallest size H-section steel, at 100mm each. Removing a single visible line from the design meant eliminating the detailed components associated with that line. Wall panels were chosen for their simple exterior finish and any apparent details such as trims and flushing were also omitted. The space is divided into four areas, a front and back on each floor. The front areas are sales spaces, and rear areas are for office and storage. 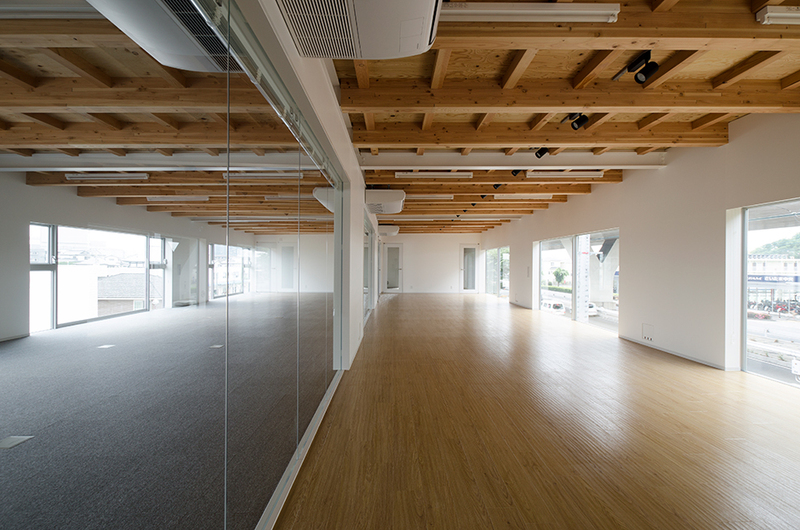 A single wall is inserted lengthways through the office plan, dividing each floor into separate spaces. Hence, three openings, front, wall and back, each overlap. We wanted to create a clear separation between front and back, but also appropriately divide the public and private spaces. 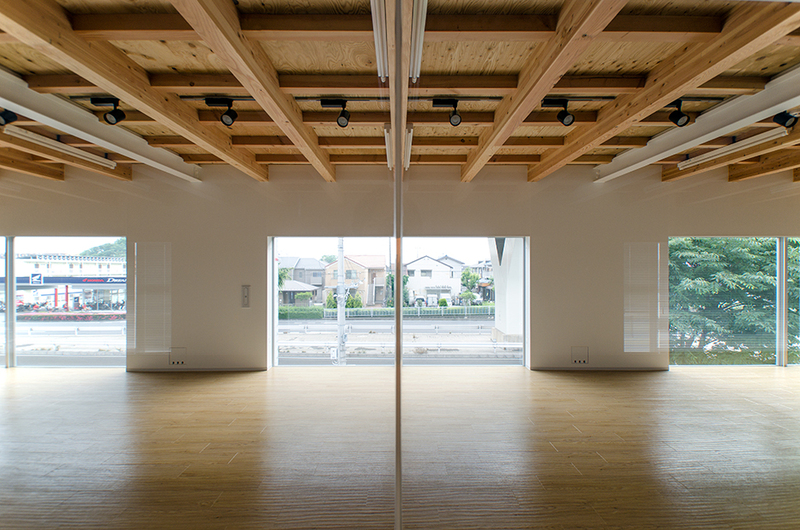 At the same time, all the rooms are filled with light from both front and back. The store window is also bright enough without needing daytime illumination. The timber floor frame is held up with wooden beams hosted between steel walls, a lightweight and cost-effective solution. 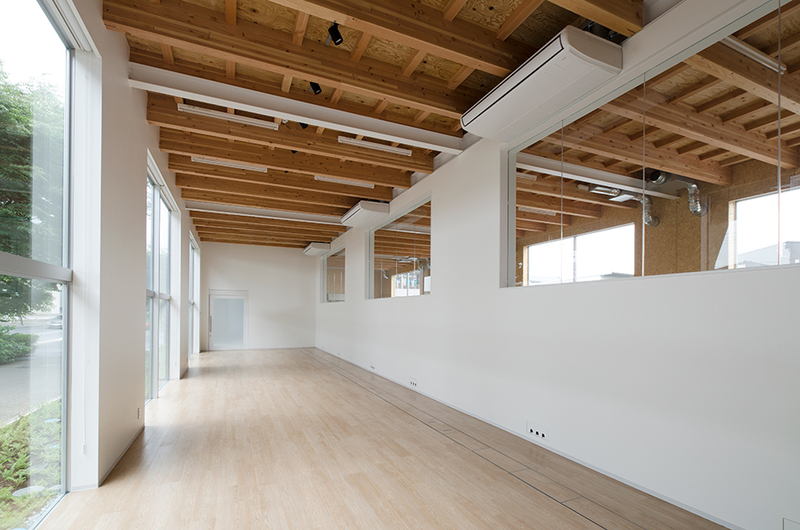 Such a structural wooden frame without any bracing becomes the ceiling finish itself, with exposed beams and floorboards visible from the floor below. This design choice makes the otherwise sterile office environment, feel warm and hospitable. 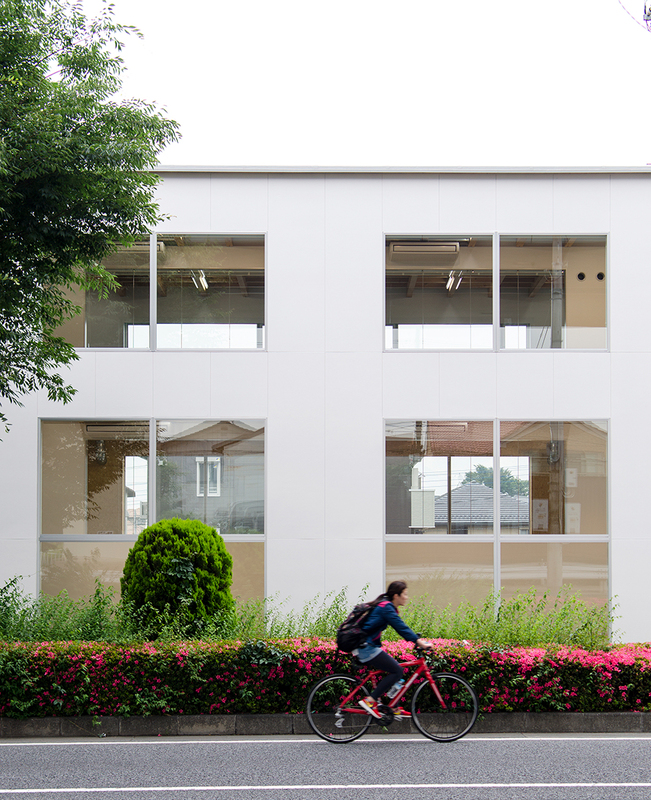 The building is organized with a traditional Japanese timber construction method using 910mm modules. 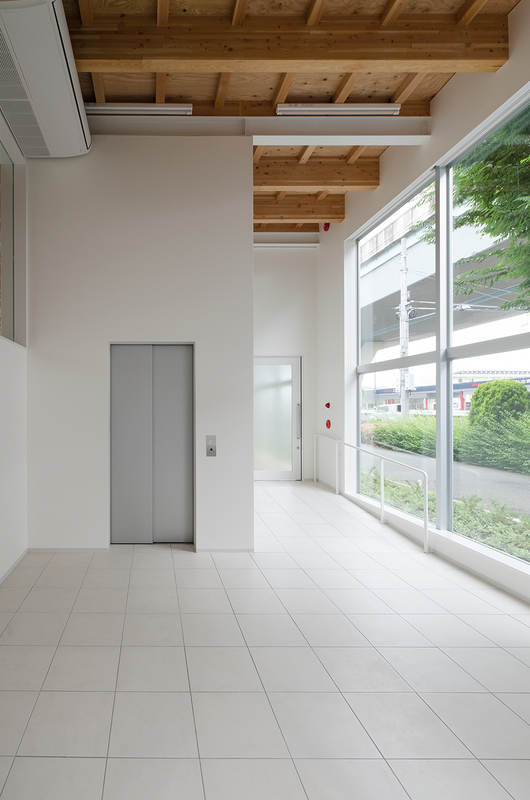 This Japanese standard is economical for the design as it allowed us to adopt standardized materials, such as veneer, wall panel finishings, and cement board. It is similar to conventional timber frame construction. The aim was to reduce overall costs by using “timber-like” construction in the right places without clinging onto the pure timber frame construction. As dusk approaches and night settles in, Office of Window’s exterior walls seemingly disappear. 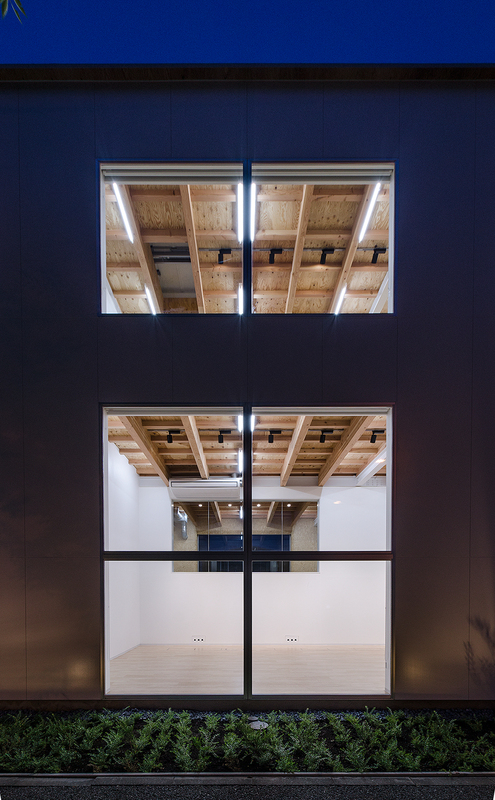 The luminance between inside and outside allows the windows to glow in the night. In the evening, passersby stop their bicycles in front of the windows, drawn in by the dramatic effect that the windows create. It is at this moment, we knew our attempt had succeeded.